A key limitation of Global Climate Models (GCMs) is the fairly coarse horizontal resolution. For the practical planning of local issues such as water resources or flood defences, countries require information on a much more local scale than GCMs are able to provide. Regional models provide one solution to this problem. Run the full GCM at a finer resolution. As the model would then take much longer to complete a simulation, you will either need a very powerful computer or to run the simulation for a much shorter period (e.g. 5 years). Use statistical techniques to ‘downscale’ the coarse, GCM results to local detail (read more about this here). These techniques assume that the relationship between large scale climate variables (e.g. grid box rainfall and pressure) and the actual rainfall measured at one particular raingauge will always be the same. So, if that relationship is known for current climate, the GCM projections of future climate can be used to predict how the rainfall measured at that raingauge will change in the future. Embed a Regional Climate Model (RCM) in the GCM. Regional Climate Models (RCMs) work by increasing the resolution of the GCM in a small, limited area of interest. An RCM might cover an area the size of western Europe, or southern Africa – typically 5000km x 5000km. The full GCM determines the very large scale effects of changing greenhouse gas concentrations and volcanic eruptions on global climate. The climate calculated by the GCM is used as input at the edges of the RCM for factors such as temperature and wind. RCMs can then resolve the local impacts given small scale information about orography (land height) and land use, giving weather and climate information at resolutions as fine as 50 or 25km. In regions where the land surface is flat for thousands of kilometres, and there is no ocean anywhere near, the coarse resolution of a GCM may be enough to accurately simulate weather changes. 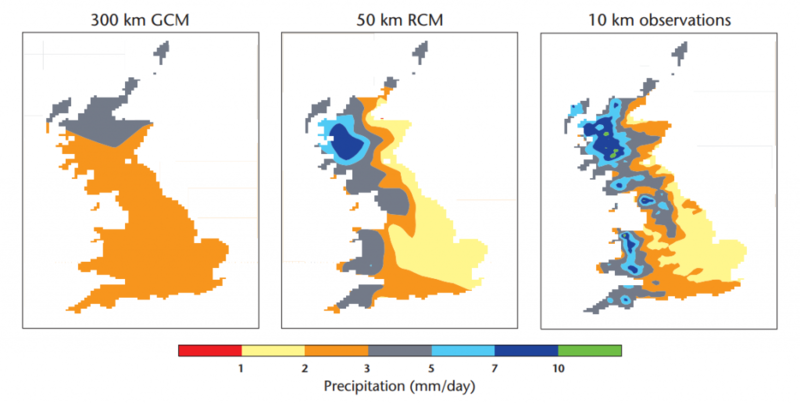 However, most land areas have mountains, coastlines and changing vegetation characteristics on much smaller scales, and RCMs can represent the effects of these on the weather much better than GCMs. Climateprediction.net has worked together with the PRECIS group to develop a series of distributed regional climate modelling experiments, called weather@home. These experiments use the same numerical models as the PRECIS project. PRECIS is the Met Office Hadley Centre project ‘Providing REgional Climates for Impacts Studies’. In the past, regional models have only been run independently of GCMs. A GCM would be run, saving all information generated for the region of interest. This information would then be the input to a subsequent RCM simulation. The climateprediction.net experiment runs the GCM and RCM together, with information being passed between the models as they move forward in time. This means that nowhere near as much output needs to be saved – making the experiment possible on a home PC. More information about RCMs in general and the PRECIS project in particular can be found here.